Pixie’s school day is an apple disaster, but a trip to the library changes everything. Fairy tales have come to life out of their books and danger is lurking. It’s up to our book-loving hero to get them out of the mysterious green book and back into their stories. But time is running out, Tick! Tock! 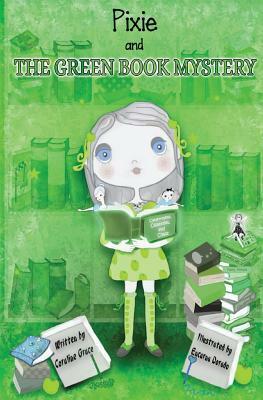 Pixie and The Green Book is a very cute children’s book that follows Pixie as she has an awful day in school and out. The only bright spot in the day was when her mother took her to the library. Pixie loves the library and was thrilled to go. But once she was there, she finds the usual librarian wasn’t there and her replacement was a mean older man who hushed her all the time. While Pixie is looking at the children’s section, she sees a glowing green book and what happens after she opens the book becomes an adventure to return fairytale characters to their books and to defeat the Book Guardian, who is trying to trap the fairy tales. Just what a girl who had a bad day needed!!! This book was very easy to read with a simple plot line that was very easy to follow. Pixie definitely was very likable and I could see a child relating to her when reading the book. The Book Guardian was a bit scary (I read this out loud to my 3 and 9-year-old) but it wasn’t anything that would give kids nightmares. My 9-year-old actually said that he reminded him of his father…..lol (which made me crack up laughing). The storyline with the fairy tales getting taken out of their books by the evil Book Guardian was very cute also. I liked the twist that the author put in as to where the fairy tales were going and I liked the paperback is better than electronic devices undercurrent. The end of the book was a bit of a cliffhanger and I was left wondering about the pencils (read the book!!). Also, and this was my favorite part of the book was the glossary at the end of the books with words that kids who are reading it might not know. The author included very simple definitions and I thought it was great!!! Also, there were some questions if the book was being read in class (or if you were reading it to your child) that made the kids think about what they just read. As a mother with a child who has reading comprehension issues, this impressed me and I wish that all children’s books in this age/grade range would do that. Why: This is a great read for anyone between the ages of 8-10 (or in grades 2-4). With a simple plotline, cute characters and a villain who was the right amount of scary, I can see children absolutely loving it. For the adults (and the children), a glossary of words that could be confusing and a question/answer section round the book out. Also, at 97 pages, this will keep a child’s attention. Why: Clean book with a very slightly scary villain.